The Wilson Real Estate Group shares that “curb appeal” is the impression your home makes from the street or the curb. Is it attractive to a potential buyer? Of course, the better your curb appeal the more likely prospective buyers are to take a look. Below Troy has suggested several things to keep in mind when selling your home with regard to its external appearance. Maintain Your Lawn: Obviously, the first thing a prospective buyer sees is your lawn. And, a neatly manicured one is important. When you begin to consider selling, also consider fertilizing! Additionally, make sure to keep every thing neatly trimmed. Imagine driving up to view a potential home and the grass is brown and landscaping overgrown. You may turn your car around and leave. Conversly, picture approaching a home with a beautiful green lawn and lovely landscaping. You want to see more! 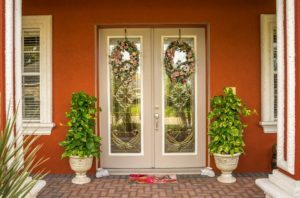 Beautify Your Front Door: The front door is truly your “Welcome” sign. Quite simply it invites buyers into your home. So always make sure it looks good. Perhaps consider giving it a fresh coat of paint. Looking for some “homey” added touches? Purchase a fresh, new welcome mat and some seasonal decor. A lovely potted plant on your front porch provides a special added touch. In short, the entryway to your home should look warm and inviting and be well-maintained. 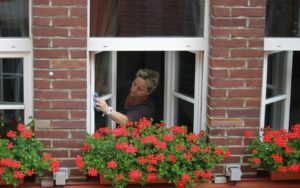 Clean Your Windows: The moment you decide to sell your house is the perfect time to clean your windows, inside and out! Understand that clear and clean windows will brighten your home, allow natural light to enter and will make your house look better. Replace Outdoor Bulbs and Repair Broken Fixtures: Potential buyers often view homes in the evening; it is important to have a well-lit entryway. Change the bulbs in your front porch fixtures and replace any that need repair. Additionally, ensure that all additional outdoor lighting (garage/patio/pool) operate appropriately. Finally, if you have patio fans, check that they are clean and operable. There is nothing worse than having a prospective buyer turn on an outdoor fan and either have nothing happen, or be sprinkled with months worth of dust. Clean All Outdoor Spaces: Well-maintained driveways, walkways, patios and screen enclosures can help sell a home. Power wash it all prior to putting your home on the market! Pay special attention to your pool screen. An enclosed pool is only an asset if the screen is in good condition (no tears in the panels) and sparkling clean (no mold on the structure). The weather in South Florida (wind, rain and humidity) takes a toll on these screens. Making sure they are in top quality condition is a great investment. The outside of your home is the first and often the last thing prospective buyers see while visiting. Keeping these areas free from clutter (no cleats on the front porch and no pool toys scattered on the deck) is wise. Clean and clear are words to live by! While the outside of your home is the first thing a potential buyer sees, a well-maintained interior is crucial to maximizing your sale price. Below are some home selling tips and tricks that can help. DeClutter Common Areas: We understand that organizing as a whole can be intimidating. Take a moment to watch this video which provides some quick tips on how to begin. Now, put this knowledge to use! First, remove excess furniture and items that you seldom use. Second, keep newspapers, toys and other articles stored neatly and out of site. Finally, check your staircase. Items left on stairs not only look messy, they can be a tripping hazard as well. Remove everything to allow free access. Clean Your Kitchen: There is nothing more off-putting than a dirty kitchen: So, a clean kitchen is a must. 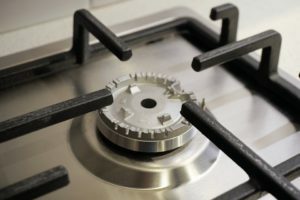 In fact, many buyers judge the state of the house by the cleanliness level of the oven and stove. This is a good time to clean them both thoroughly. Also, wipe down the interior of your dishwasher, removing stains especially on the door. And, make sure it smells fresh. Declutter your cabinets; aim for keeping everything at 80% of capacity here as well; you want there to be space. Finally, clear off your countertops; put bills, homework and mail neatly away! 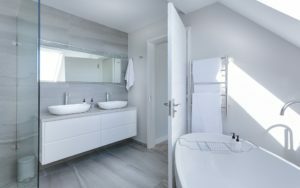 Scrub Your Bathrooms: Sparkling bathrooms can help sell your home! Today, begin to repair caulking in bathtubs and showers. Remove any soap film from shower doors, ceramic tile and grout. Also, this is a great time to pick up some brand new towels, bath mats and shower curtains for an added touch! (Here is a hint: make sure bathroom cabinets are neat and organized and, confirm that your shower is not over run with shampoo bottles, razors and soaps). Aim for a calming “spa-like” appearance. A minimalistic approach is best. Say Hello To Sunshine: Open your drapes and curtains and welcome in the natural light! To be honest, daylight highlights ceilings and walls and makes your home seem cheerful and bright! The open drapes combined with your newly cleaned and sparkling windows truly add value. Update Decor: Tasteful decorating helps assure top dollar and a quicker sale. Let’s face it, faded walls and scratched woodwork reduce your home’s appeal. 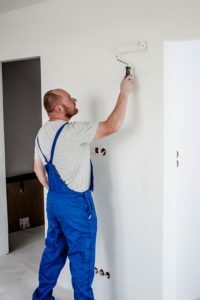 Fresh paint and new wallpaper add charm and value to your property. Prospects would rather see how great your home looks now, rather than having to imagine how good it could look with a little work. Make Minor Repairs: Small things make a big difference. Ensure that all closet doors are on their tracks, tighten loose doorknobs and make certain that all screen doors easily close. Don’t try to explain these sticky situations when you can easily remedy them in advance. A little effort up-front can smooth the way towards closing. Check Faucets and Bulbs. 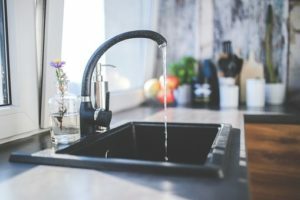 Dripping water rattles the nerves and discoloring of the sink suggests neglect to the property, all negatives in the mind of a potential buyer. Have them fixed so you get top dollar for your house. Maximize Storage Space: Remember potential buyers are looking for more than just comfortable living space. They are looking for storage space too. Make sure your attic and garage are clean and free of unnecessary items. Click here for some garage organizing tips. Think Safety. Homeowners learn to live with all kinds of self-set booby-traps: roller skates on stairs, slippery throw rugs, and low-hanging overhead lights. Make your residence as non-perilous as possible. By taking these suggestions to heart, you can prepare your home to look its best prior to putting it on the market. The less potential buyers have to criticize; the more likely they are to make a reasonable offer. Individuals are more likely to be interested in a property when their visit is positive. So, help maximize their experience by adopting these suggestions. Leave: Yup, it’s that simple. Making introductions is distracting. That said, have as few people in the home when showing as possible. An empty home puts prospective buyers at ease and provides them the opportunity to clearly absorb the advantages of your property. Simply put, buyers are more likely to discuss the home and ask questions when the homeowner is not present. 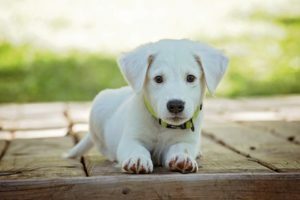 Relocate Your Pet: We understand your dog is friendly, and of course your kitten is adorable. Remember, not everyone is an animal lover. And, even those who are may not love them in their potential new home. They are distracting and some people are terrified of them. If you have a pet, we suggest you keep it out of the way, preferably out of the house. Also, it is wise to remove feeding bowls, cages, toys and litter boxes. Some people view animals as less than clean. Out of site, out of mind! Keep Quiet: If you do happen to be home during a showing, allow the sales associate to talk. Be polite, but do not strike up conversations with the prospective buyers. Your sales associate has already given details on your property and needs the buyers’ full attention to optimize their interest. Don’t Apologize. No matter how humble your abode, never apologize for its shortcomings. If a prospect volunteers a derogatory remark about your home, let their agent handle it. Avoid Extra Sales Pitches: First sell the house. Do not try to sell the buyer your furniture, rugs or drapes at this time. If the buyer desires any of your furnishings, they will let the realtor know and that information will be communicated to you. Minimize Noise: Turn off your radio and/or television. A quiet home makes for minimal disruptions. If you must be home; make yourself scarce and turn everything off! Defer to Experience. When a prospect wants to talk about price, terms and conditions, let them speak to an expert, your real estate agent. This is the added value a good agent brings; they leverage their highly effective negotiating and training techniques. In short, if you can leave during showings you should. If you must be home, minimize your presence to allow the buyer to view your home without distraction or concern. Finally, a good realtor will work closely with you to confirm you have maximized these general home selling tips and to ensure that your house is in the best possible condition for sale. He or she will go room by room and provide advice and suggestions on staging your home to increase its value and decrease its time on the market. The Wilson Real Estate Group does this each and every time. Pay attention to the advice your realtor provides and make sure to him/her any questions you may have. By working together to prepare your house for sale you are setting yourself up for success. Your real estate agent is the best source of information about the local community and real estate topics. Give The Wilson Group a call today at 954-818-6092 to learn more about local areas, discuss selling a house, or tour available homes for sale.